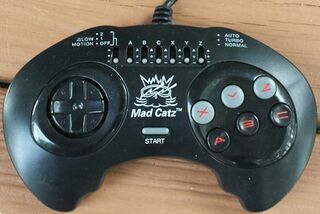 The Mad Catz 6 Button Controller is a third-party controller for the Sega Mega Drive developed by Mad Catz and released variously under the Mad Catz and High Frequency branding. It is, as the name suggests, a six button controller with added turbo features—the logical upgrade from their 3 button variants. Both black and transparent versions exist. Gamester distributed the peripheral in Europe as the MD-6. An equivalent six-button controller was also released for the Super Nintendo Entertainment System, with the same diverse branding, under names such as the Mad Catz/High Frequency Advanced Control Pad and the Gamester SN-8.